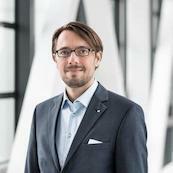 Dr. Marco Schneider received his degree as Diplom-Ingenieur in mechanical engineering from the University of Stuttgart in 2005. Afterwards he worked as research assistant at the Institute for Machine Tools at the University of Stuttgart, where he was responsible for the research team for industrial wood working technologies and did his PhD. Since 2012 he is working at Fraunhofer IPA at the department for Light Weight Construction Technologies. He is head of the department and Divisional Director Manufacturing and Process Engineering, where he is additionally responsible for the department of Additive Manufacturing and the business unit Machinery and Equipment Industry. Dr. Schneider is reviewer for scientific magazines and author and co-author of many scientific articles.